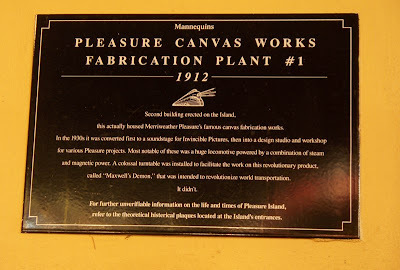 We have discussed the backstory and history of Pleasure Island at Downtown Disney a number of times here at the Gazette. With the current renovations taking place on the Island, it would appear that we are stepping ever and ever closer to another page of that history. Still, with all of these changes afoot, and with the doors to the clubs shuttered, it is nice to see the plaques that tell the “original” history of the area remain. Second building erected on the Island, this actually housed Merriweather Pleasure’s famous canvas works. In the 1930s it was converted to a soundstage for Invisible Pictures, then into a design studio and workshop for various Pleasure projects. Most notable of these was a huge locomotive powered by a combination of steam and magnetic power. A colossal turntable was installed to facilitate the work on this revolutionary product, called “Maxwell’s Demon,” that was intended to revolutionize world transportation. It didn’t.